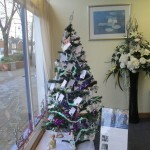 Each year, all Lodge Brothers branches invite clients past and present to come in and write a Remembrance Tag with a message to a lost loved one, which can then be placed on the ‘Tree of Remembrance’. This simple act is often of great comfort to the recently bereaved. As usual, the tree will be on display until Twelfth Night.